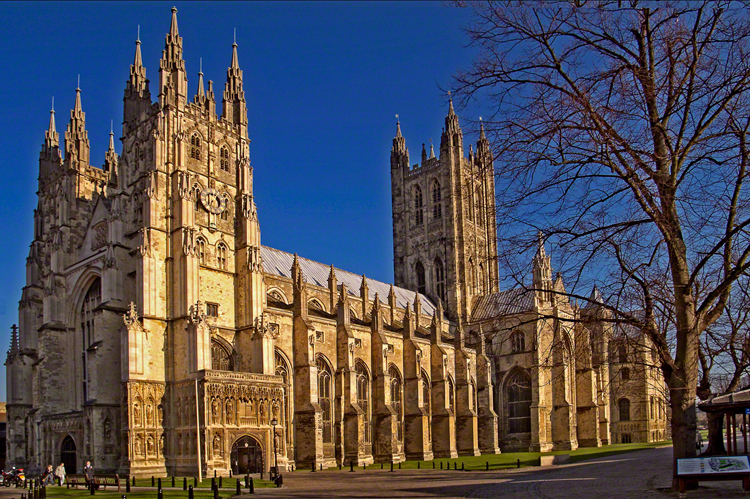 Canterbury Cathedral is often called ‘England in stone’ as its history is so closely linked to England’s history. Canterbury calls itself the Mother Church of the Worldwide Anglican Communion and it is the seat of the Archbishop of Canterbury. It is part of a World Heritage site and is one of the oldest and most famous Christian structures in England. Bede had hinted at a Roman church as early as the late 4th century but Canterbury was officially founded in 597AD after Pope Gregory sent a mission to the Anglo Saxons. It has suffered several serious fires down the ages; it was rebuilt in 1070 after a fire and rebuilt again in 1174 in the largely Gothic style you see today. Thomas Becket was murdered in the cathedral in 1170 by the knights of Henry II (who had said ‘who will rid me of this turbulent priest?’). Before the Reformation the cathedral was part of a Benedictine monastic community known as Christ Church. Pilgrims like those portrayed in Geoffrey Chaucer’s ‘Canterbury Tales’ would visit the shrine of Thomas Becket regarding Canterbury as a place of healing. Chaucer (born in 1342) was England’s most important poet before Shakespeare. Among his influences was Dante and in the last two years of his life he wrote about his story-telling pilgrims journeying from the Tabard Inn in Southwark to the Becket shrine. The shrine was removed by Henry VIII in 1538 and the cathedral ceased to be an abbey during ‘The Dissolution of the Monasteries’. Canterbury has a library of 30,000 pre-20th century books and 20,000 later books. The on-line catalogue is held at the University of Kent. Location: The Precincts, near Broad Street in Canterbury.